that You have brought me this far? For You are God, O Sovereign Lord. 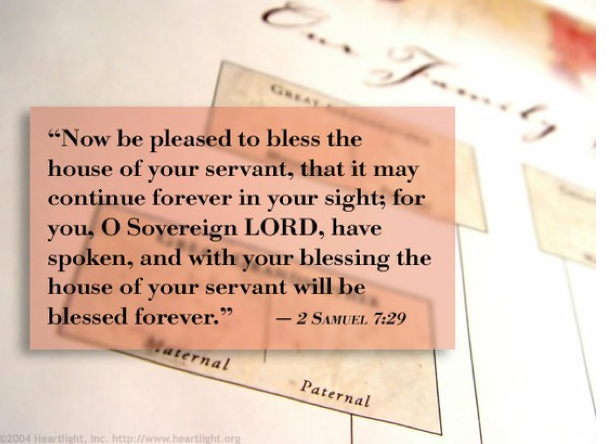 these good things to Your servant. so that it may continue forever before You. it is an eternal blessing! dwelling within through His Spirit. in His presence is fullness of life. His presence always brings blessing. and be ever mindful of who You are. I ask that I have a holy "fear of the Lord"
on my heart this morning. it is an eternal blessing. and a promise for eternity. this house will be blessed forever. We are a grateful family.